Located at 6080 McKay Avenue Burnaby, the final release at the master planned Station Square Metrotown real estate development is upon us! 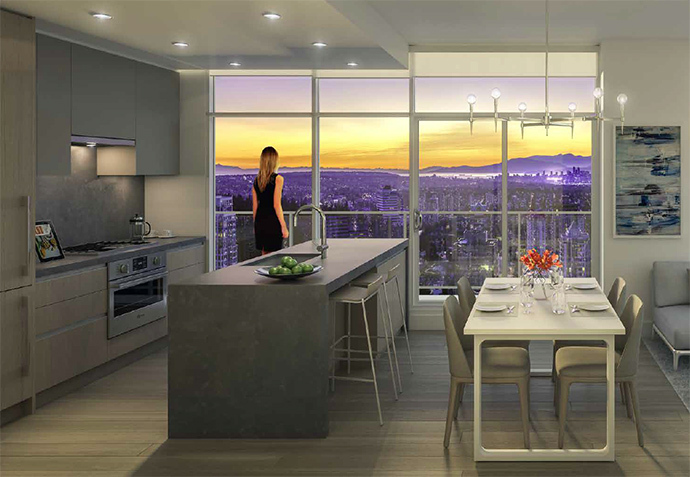 Station Square 3 Burnaby presales condos features 41 floors of unparalleled views in a transit oriented neighbourhood with world class dining and shopping. Making a superb architectural impression on the Metro Vancouver skyline, 6080 McKay Avenue Burnaby Station Square 3 tower will feature a slim, central spine establishing an elegant connection between the ground level, podium and tower components of the project. There are alternating patters of four storey white and grey stacks that play upwards along the high-rises’ façade. 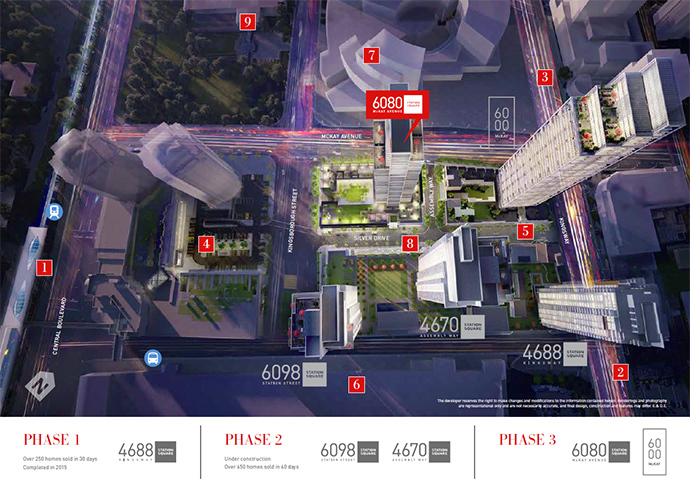 An iconic red square will prominently feature the top of the phase 3 tower. For homebuyers seeking the best interior finishes, look no further! Modern interiors at the Station Square Phase 3 tower in Metrotown Burnaby will be meticulously designed to inspire residents. Layouts are thoughtfully designed to emphasize the efficiency of space and for the abundance of natural light throughout the day. Contemporary kitchens will accentuate the flow of convenience with a collection of premium stainless steel Bosch appliances and intelligent storage solutions. In addition, the presale Burnaby Station Square 3 condos will feature bathrooms that provide a sanctuary with a natural beauty of stone style tile on both the floors and walls. The on-site building amenities at Station Square 3 Metrotown condos at 6080 McKay Avenue Burnaby will feature an impressive arrival with a 24 hour concierge in a double height hotel inspired lobby entrance in addition to a beautiful guest suite. As well, residents can enjoy exclusive use to a relaxing indoor lounge that has a chef inspired kitchen (great for entertaining friends and family) in addition to a fully equipped gym, yoga and spin facility that faces a peaceful pond. The building will also have a lushly landscaped rooftop garden that’s perched above the podium. It’s a great place to socialize with your neighbours as well as to entertain. Located along the pedestrian friendly streetscape of Silver Drive, the Metrotown Station Square Phase 3 condos are located just next to vibrant shops, restaurants and services. Fulfill all your needs right outside your home, with grocery stores, banks, medical services, Earls, Cactus Club, highly ranked schools and universities and of course, the SkyTrain and bus networks. 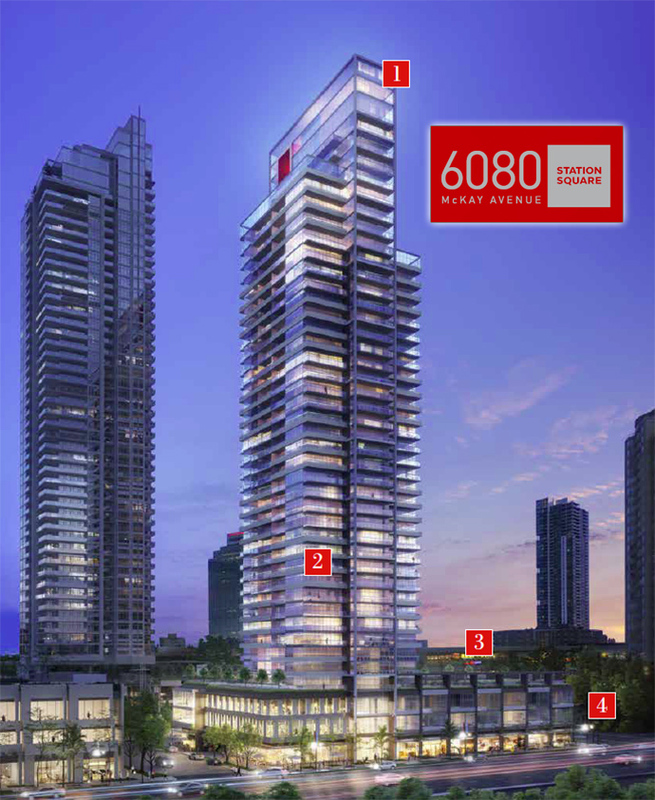 The Station Square 3 Metrotown Condo tower will be built to LEED Silver standards. There are also 42 electric car charging stations! The Phase 3 condos at Burnaby’s Station Square development in Metrotown features fine finishes and features in every suite. The kitchens will have contemporary flat panel two tone wood laminate upper and lower cabinets with soft close functionality and stain chrome hardware for that modern look. There is under cabinetry task lights as well as luxurious and durable quartz stone counters with full height backsplashes. The Station Square presale condos will also feature generous ProChef under mount stainless steel sink, quality Grohe chrome faucet with pull out spray and stainless steel Bosch appliance set that includes a gas cooktop, electric wall oven, integrated dishwasher with stainless steel interior and an integrated fridge/freezer. There is also a stainless steel microwave with trim kit and slim line Faber hood fan. Select floor plans will also have a magic corner with built out shelving system and an appliance garage. The bathrooms at the Phase 3 Station Square Metrotown condos include soft close cabinetry hardware in vanities and luxurious stone quartz counters with under mount sink. The bathrooms will have Duravit dual flush toilets, LED under cabinetry lighting, satin chrome hardware, rain shower head, deep soaker tub and medicine cabinets. Select bathrooms feature sleek 10mm frameless glass showers and refined porcelain wall and floor tile in both the main bath and ensuite as per floor plan. The living spaces at Phase 3 Station Square Burnaby presale condos include two designer colour schemes by BYU Design. The floor plans are functional and efficient and heating is by baseboard. Ceiling heights are up to 9 feet and there are roller blinds throughout. All homes are backed by the National 2-5-10 New Home Warranty and the building is securely controlled via fobs. 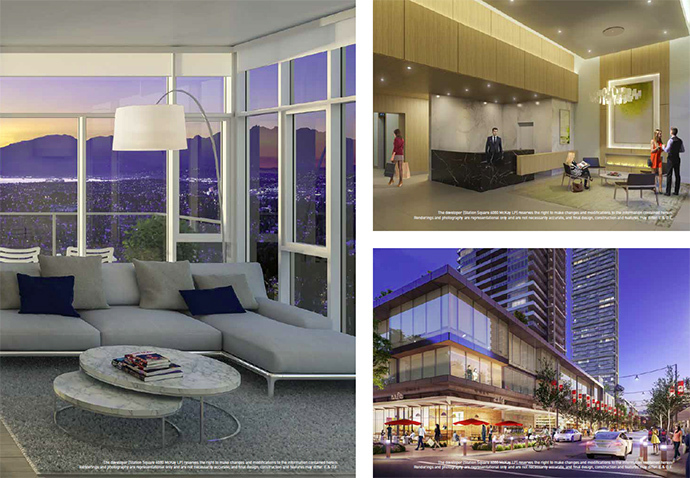 The Station Square Burnaby condo development is brought to you by Anthem Properties and Beedie Living. There’s certainly many floor plans to choose from at the final tower at Station Square Metrotown with Plan A (1 bedroom between 536 – 541 sqft), B (747 square foot 2 bedroom suite with 178 sf balcony), C (2 bedroom plus den between 789-792sf plus 215-308sf balcony) as the main layouts featured. 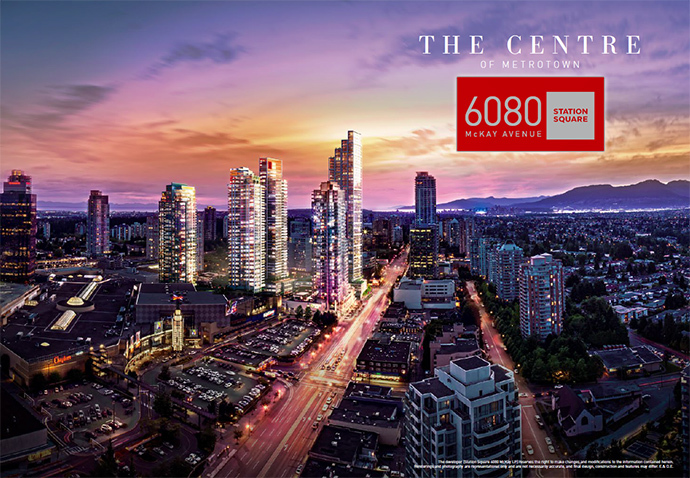 The final tower release at the Station Square Metrotown master planned community features both a connected community and a transit oriented neighbourhood that gets you to and from every single point in the Lower Mainland with ease and efficiency. With direct access to the Metrotown SkyTrain station and bus network, residents at 6080 McKay Avenue Burnaby will be able to get to downtown Vancouver, UBC, the Tri-Cities, and Surrey very quickly. Roads and highways are also just outside your door. YVR is also a stone throw away. Kingsway Retail along the gateway between Burnaby and Vancouver features lots of stores and services, restaurants and dining options. Station Square Shopping Centre will feature new big box retails as well as boutique stores for you to enjoy. Silver Drive is an energetic main artery of Station Square Phase 3 Metrotown condo development with great boutiques, eateries, art installations, social spaces and everyday essentials like banks and grocery stores. Metropolis at Metrotown with all of its four hundred and fifty services and shops are connected to Station Square. It’s actually the largest shopping centre in all of BC. Crystal Mall (the largest Asian Mall) in Burnaby will also give you plenty to browse. Station Square 3 Burnaby condos are also situated just steps from ‘Restaurant Row’ which features a diverse selection of dining establishments that include Cactus Club Café and Earls Restaurant.